It’s crazy the places that church planting will take you. I just came back from a five day trip to Seoul. I was invited by SaRang Church (SaRang means love in Korean, by the way) to their missions conference because they want to partner with Redeemer. I met Pastor Sam Ko, SaRang’s Director of Global Ministries, in Manchester this past November and he was very enthusiastic about partnering with Redeemer. Sometimes our lives gets so busy and action-oriented that I don’t stop for a second to look at everything (replace “our lives” with “my life” and “everything” with “the mess”). Shinichi Maruyama, in his Kusho series, takes something that would normally be seen as action, and attempts to express a frozen moment. There are many artists who do this kind of abstraction, you could even make the case that all art abstracts time in some way. But there’s something more that got me interested in Maruyama’s work, though I’m still not sure what it is. Maybe it’s because he also does Nihonga and Makoto Fujimura, who I love, also does Nihonga and deals with time (though in a different fashion), or maybe it’s the high contrast of the photographs themselves (the stopped action is something so obviously completely other than its surroundings). Or maybe I just like looking at them, especially the Kusho movie, I think it really gets at his “writing in the sky” idea. One thing that I do know I like is his presentation of the preciousness of the moment. Sometimes the moments are serene, sometimes violent, each seem to be unique and each give a feel of significance. Spending the time he does gives the moment value, importance, something of worth. This speaks to me, knowing that I don’t give time its due significance, which leads to a little obsession with the subject (but I’m a musician, so I should be obsessed a little with time). It also brings up the idea that if God is infinite and outside of the constraint of time, then He can spend an infinite amount of time on one moment. He would be able to see our moments better than we can. These abstractions by Maruyama would not be abstraction for God. This is really comforting for me, knowing that not only is God my future hope, but He is here. With me. Right now. I overlook/disdain/take for granted this idea very often and my life is less for that. 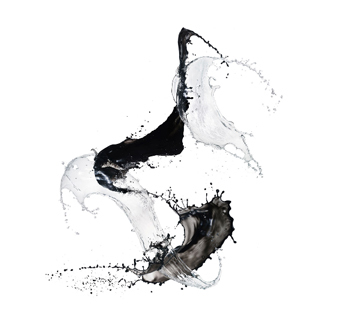 I hope that Shinichi Maruyama’s work will not just be something amusing for me to look at, but will show me another aspect of God’s Person.